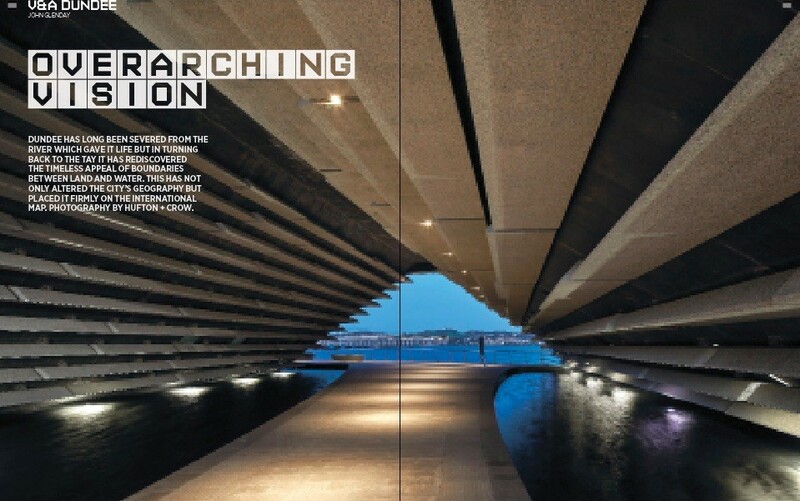 Dundee has long been severed from the river which gave it life but in turning back to the Tay it has rediscovered the timeless appeal of boundaries between land and water. this has not only altered the city’s geography but placed it firmly on the international map. Photography by Hufton + Crow. 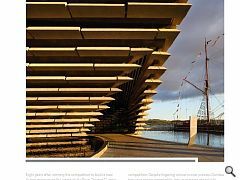 Eight years after winning the competition to build a new design museum on the banks of the River Tay and 12 years after the first conversations surrounding a waterfront set-piece began Dundee’s V&A Museum has opened its doors to an expectant public, but is it £80m well spent? Urban Realm was among the first to step through the cliff-like concrete portal to find out. 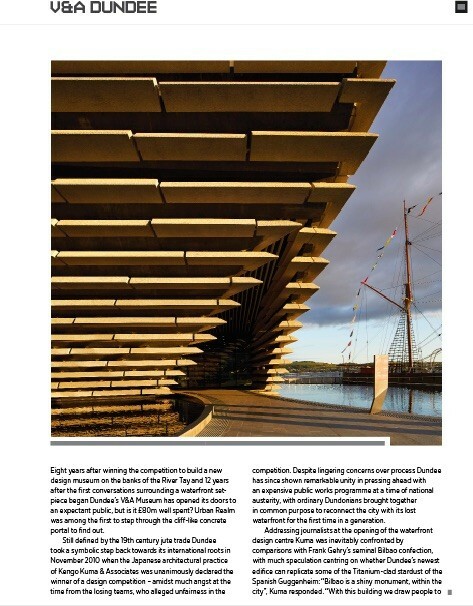 Still defined by the 19th century jute trade Dundee took a symbolic step back towards its international roots in November 2010 when the Japanese architectural practice of Kengo Kuma & Associates was unanimously declared the winner of a design competition – amidst much angst at the time from the losing teams, who alleged unfairness in the competition. 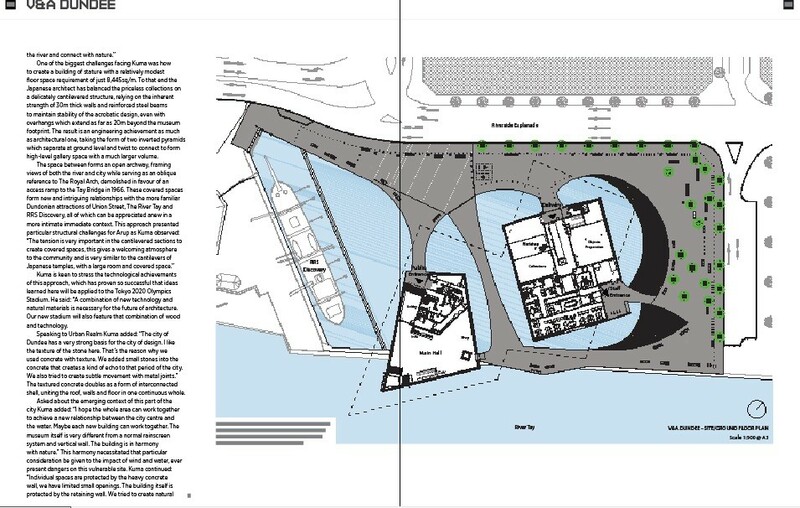 Despite lingering concerns over process Dundee has since shown remarkable unity in pressing ahead with an expensive public works programme at a time of national austerity, with ordinary Dundonians brought together in common purpose to reconnect the city with its lost waterfront for the first time in a generation. 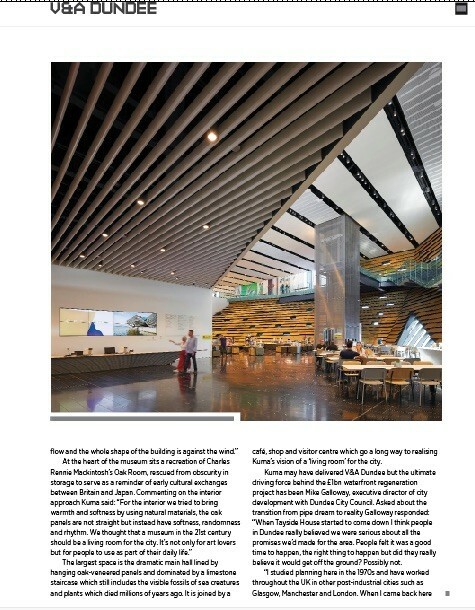 One of the biggest challenges facing Kuma was how to create a building of stature with a relatively modest floor space requirement of just 8,445sq/m. To that end the Japanese architect has balanced the priceless collections on a delicately cantilevered structure, relying on the inherent strength of 30m thick walls and reinforced steel beams to maintain stability of the acrobatic design, even with overhangs which extend as far as 20m beyond the museum footprint. 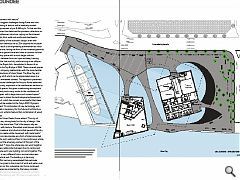 The result is an engineering achievement as much as architectural one, taking the form of two inverted pyramids which separate at ground level and twist to connect to form high-level gallery space with a much larger volume. Kuma is keen to stress the technological achievements of this approach, which has proven so successful that ideas learned here will be applied to the Tokyo 2020 Olympics Stadium. 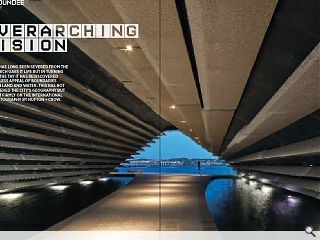 He said: “A combination of new technology and natural materials is necessary for the future of architecture. Our new stadium will also feature that combination of wood and technology. 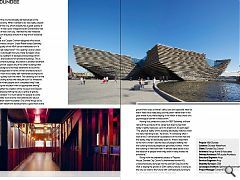 Speaking to Urban Realm Kuma added: “The city of Dundee has a very strong basis for the city of design. I like the texture of the stone here. That’s the reason why we used concrete with texture. We added small stones into the concrete that creates a kind of echo to that period of the city. We also tried to create subtle movement with metal joints.” The textured concrete doubles as a form of interconnected shell, uniting the roof, walls and floor in one continuous whole. The largest space is the dramatic main hall lined by hanging oak-veneered panels and dominated by a limestone staircase which still includes the visible fossils of sea creatures and plants which died millions of years ago. 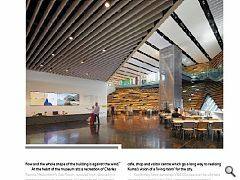 It is joined by a café, shop and visitor centre which go a long way to realising Kuma’s vision of a ‘living room’ for the city. 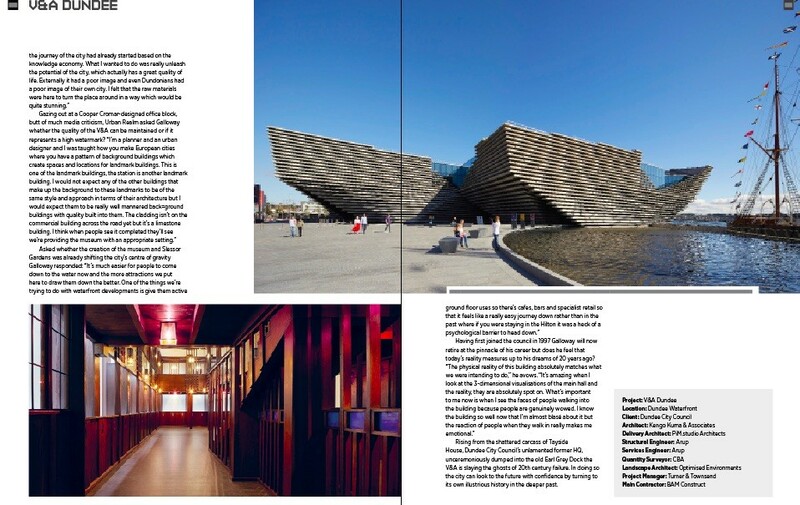 Kuma may have delivered V&A Dundee but the ultimate driving force behind the £1bn waterfront regeneration project has been Mike Galloway, executive director of city development with Dundee City Council. Asked about the transition from pipe dream to reality Galloway responded: “When Tayside House started to come down I think people in Dundee really believed we were serious about all the promises we’d made for the area. People felt it was a good time to happen, the right thing to happen but did they really believe it would get off the ground? Possibly not. Rising from the shattered carcass of Tayside House, Dundee City Council’s unlamented former HQ, unceremoniously dumped into the old Earl Grey Dock the V&A is slaying the ghosts of 20th century failure. In doing so the city can look to the future with confidence by turning to its own illustrious history in the deeper past.